Bon Scrapatit Designs: OMGOSH ... A SPECIAL DELIVERY FOR Y'ALL TONIGHT AND ONE FOR ME TOO!!! OMGOSH ... A SPECIAL DELIVERY FOR Y'ALL TONIGHT AND ONE FOR ME TOO!!! YES! YES! YEEEEEESSSSSS! I am going to be a GRANDMA sometime in the next few hours and I've got to get up out of this chair, take a shower, get new batteries for the camera and wake Robert up to take me to the hospital (30 minutes away) in just a bit as they think "baby boy" (LOL ... they keep changing his name, so I'll let you know as soon as I do!!!) will be here in the next four-to-five hours. OMGosh, I can hardly type. Listening to Chicago, tears welled in eyes as I think about holding a PRECIOUS new bundle of joy in my arms! I'm STOKED! 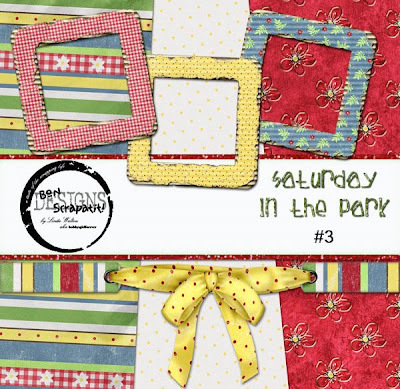 Okay, before I make a complete silly of myself, I am leaving you with *Saturday In The Park* #4 and it is not what I hoped it would be!!! I will work on some more goodies when things settle down and I can focus! I am SO totally LOVING background paper #12!!! I hope you will like it too! PLEASE - will y'all do me a HUGE favor??? My dear sweet friend, Liz Hutchison aka Sweet Digi Scraps (23-year-old designing mama to three ADORABLE little girls!!! ), is celebrating her GRAND OPENING today over at BEEN THERE SCRAPPED THAT and I am not going to be able to attend - sniff, sniff! I am SO bummed but then I am SO excited too!!! He, he ... Would y'all take a few moments to go over and look around and enjoy the view. Liz and her partner are both VERY talented designers and I just know you'll see something that you'll fall in love with and the prices are an INCREDIBLE bargain! I am sure that Liz and Colie have some VERY nice goodies awaiting y'all as well! Why not stop into the forum and introduce yourselves and tell them I sent you!!! Please leave me a comment and let me know how it goes so that I can catch up whenever I return home. PRETTY PLEASE! I'm not sure when I will be back but I know y'all are FABULOUS reporters and will keep me clued in as to what is happening!!! THANK YOU ALL for being such an INSPIRATION to me EVERY single day! Funny, I'm actually listening to "You're The Inspiration" by Chicago as I'm typing this!!! Believe it or not, I had INCREDIBLE mother's instinct going on all day today as I told three or four people that we could have a baby coming ANY time now! The last one I spoke those words to was Robert and just a few hours later I received the call from my son!!! Due date WAS the 24th!!! I am SOOOOOOOOOOO jazzed. I'd better fly y'all!!! I'll be back with pics!!! EEKS - Mark just called and they've just given Jess an epidural - I'd better put it in HIGH gear over here!! !